The County of Orange and OC Parks are pleased to present the annual Sunset Cinema film series, featuring 14 free family-friendly movies at Carbon Canyon Regional Park, Craig Regional Park, Mason Regional Park, Irvine Regional Park, Yorba Regional Park, Laguna Niguel Regional Park and Bluff Park at Salt Creek Beach. Sunset Cinema brings recent and classic films to your favorite regional parks on select Friday and Saturday evenings June 16 – September 14 around sunset. The first free movie night of the series kicked off on Saturday, June 16 at Carbon Canyon Regional Park in Brea with a screening of Disney’s new take on The Jungle Book. On Friday, July 13, gather the family for the comedy Trolls at Mason Regional Park. The following week, join in on the ghost hunt with the comedy and action-packed original film Ghostbusters on Saturday, July 20 at Mason Regional Park. Sunset Cinema then moves to Irvine Regional Park in Orange and invites families to experience a world of anthropomorphic animals in Disney’s Zootopia on Friday, July 27. Practice your best karate moves for the classic film, The Karate Kid screening on Friday, August 3 at Irvine Regional Park. On Friday, August 10, gather friends and family for The Secret Life of Pets at Yorba Regional Park in Anaheim and discover what pets may be doing while their owners are away. Friday, August 17 welcomes the ’90s classic A League of Their Own at Yorba Regional Park. Head over to Laguna Niguel Regional Park for Disney and Pixar’s vibrant tale of family, fun and adventure with Coco on Friday, August 24. The following week, join archaeologist and adventurer Indiana Jones on his journey in The Raiders of the Lost Ark on Friday, August 31 at Laguna Niguel Regional Park. The Sunset Cinema series continues at Salt Creek Beach in Dana Point where families can take a virtual trip across the ocean to ancient Polynesia with Moana on Friday, September 7. 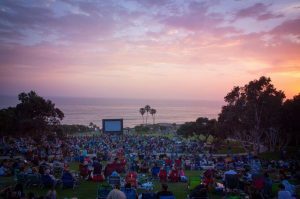 Wrap up the summer with a thrilling seaside movie at Bluff Park at Salt Creek Beach during Steven Spielberg’s Jaws on Friday, September 14. “Movie lovers of all ages can enjoy gathering outside with friends and family to watch their favorite classic and contemporary films at these fun, free events,” said Supervisor Andrew Do, Chairman of the Orange County Board of Supervisors. Pack a picnic, blankets and beach chairs and head to OC Parks Sunset Cinema to enjoy recent popular films and introduce the young ones in your life to timeless classics. All movies are free to attend, with free parking beginning at 6 p.m. and show times starting around 8 p.m. after the sun begins to set. Movies will feature pre-show entertainment that varies per park including arts and crafts, activities, demonstrations and entertainers. Food trucks will be serving onsite and a beer and wine garden will be available to those 21 and over. For more information visit www.ocparks.com.